Golden State is coming off a very surprising defeat at the hands of the Harden-less Rockets on Saturday night, and that was not even the worst of it. Draymond Green’s ankle was badly hurt in the team’s last game, and he will likely remain out of tonight’s contest. Ball movement is far less crisp without him in. Charlotte, on the other hand, blew one against the Nets last time out and relied on the refs to blow the whistle on the final play involving Kemba. They didn’t, so the Hornets lost. They are fighting for their playoff lives, and to ensure that Kemba stays, they NEED a top-eight seed. The top scoring team in the league yet again, Golden State has continued to pour in the points. Steph and Klay continue to show the league why they are called the “splash brothers.” They continue to rain in the three-balls and put up points faster than any other players around the league. Kevin Durant continues to score points at a high rate, but outside of the three of them, the scoring continues to be inconsistent. They have not been all that scary with DeMarcus Cousins as we expected. But at the end of the day, they are still the team to beat in the league, and every time we watch them play a game, we are likely rooting against them. Who can beat Golden State? As a huge fan of the NBA, the best games to watch are ones where a team is giving the Warriors a run for their money. They have been struggling of late, and they have not been able to gain any traction all season. 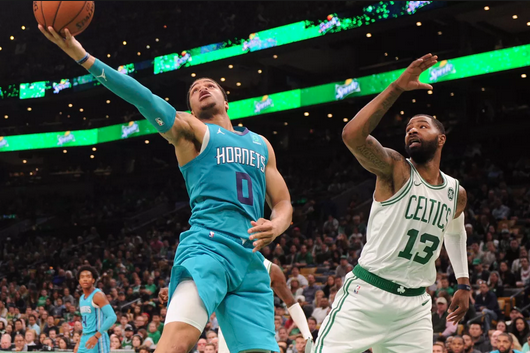 The long win streak that many people might be expecting from the Hornets is just not coming. They failed to land Marc Gasol at the deadline, and so decided to keep their team exactly the same, which was a very unwise decision. Kemba has been terrific all season, but he has not had an ounce of help. Jeremy Lamb is the team’s #2 scorer, but he now comes off the bench. Marvin Williams and Malik Monk can score, but should not be anything close to top options. James Borrego has been doing a good job when you consider what he has to work with, but it is still very disappointing. Young rookie Miles Bridges has shown some impressive signs of being a key contributor, but he’s not doing enough. It would be great to see Kemba back in the playoffs, just so the team can show him that they will never quit. Warriors! Golden State is going to get the win, Draymond or not. This team is very tough to beat, and unless CHA plays absolutely perfect basketball, they won’t be able to get the job done. A big game for KD will help power GS to victory!